I imagine my last was not so ambiguous but that you saw well enough I staid in town to see Hamlet, and I will venture to say, that it was such an entertainment as will probably never again be exhibited to an admiring world. But this general panegyric can give you no idea of my feelings; and particular praise would be injurious to his excellences. In every part he filled the whole soul of the spectator, and transcended the most finished idea of the poet. The requisites for Hamlet are not only various, but opposed. In him they are all united, and as it were concentrated. One thing I must particularly remark, that, whether in the simulation of madness, in the sinkings of despair, in the familiarity of friendship, in the whirlwind of passion, or in the meltings of tenderness, he never once forgot he was a prince; and in every variety of situation, and transition of feeling, you discovered the highest polish of fine breeding and courtly manners. Hamlet experiences the conflict of many passions and affections, but filial love ever takes the lead; that is the great point from which he sets out, and to which he returns; the others are all contingent and subordinate to it, and are cherished or renounced, as they promote or obstruct the operation of this leading principle. Had you seen with what exquisite art and skill Garrick maintained the subserviency of the less to the greater interests, you would agree with me, of what importance to the perfection of acting, is that consummate good sense which always pervades every part of his performances. To the most eloquent expression of the eye, to the hand-writing of the passions on his features, to a sensibility which tears to pieces the hearts of his auditors, to powers so unparalleled, he adds a judgment of the most exquisite accuracy, the fruit of long experience and close observation, by which he preserves every gradation and transition of the passions, keeping all under the controul of a just dependence and natural consistency. So naturally, indeed, do the ideas of the poet seem to mix with his own, that he seemed himself to be engaged in a succession of affecting situations, not giving utterance to a speech, but to the instantaneous expression of his feelings, delivered in the most affecting tones of voice, and with gestures that belong only to nature. It was a fiction as delightful as fancy, and as touching as truth. A few nights before I saw him in ‘Abel Drugger;’ and had I not seen him in both, I should have thought it as possible for Milton to have written ‘Hudibras,’ and Butler ‘Paradise Lost,’ as for one man to have played ‘Hamlet’ and ‘Drugger’ with such excellence. I found myself, not only in the best place, but with the best company in the house, for I sat next the orchestra, in which were a number of my acquaintance (and those no vulgar names) Edmund and Richard Burke, Dr. Warton, and Sheridan. Comments: Hannah More (1745-1833) was a British playwright, poet and philanthropist. This letter from 1776 is reproduced in her biography. 1776 was David Garrick‘s final year as a stage performer, and his performance in Hamlet was 30 May 1776 at Drury Lane, a production that sold out in two hours. He had played Abel Drugger in The Alchemist for the last time on 11 April 1776. More, a personal friend, saw several of Garrick’s final performances at this time. 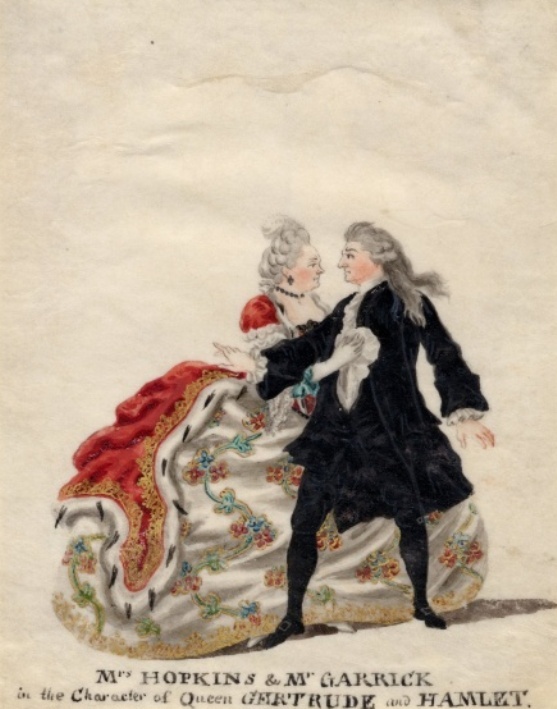 Text: Now, my dear B., if, after what I have told you, you have been able to picture a Garrick to yourself, follow me with him in one or two scenes. To-day, because I am somewhat in the humour for it, I will take the one out of Hamlet where the Ghost appears to him. You know this scene already from Mr. Partridge’s excellent description in Fielding. My description will not make the other superfluous, but only explain it. Hamlet appears in black attire, the only one, alas, which is still worn in the whole court, for his poor father, who has been scarcely dead a couple of months. Horatio and Marcellus accompany him in uniform. They await the Ghost. Hamlet has folded his arms and pulled his hat over his eyes. It is a cold night, and just twelve o’clock. The theatre is darkened, and the whole audience as still and the faces as motionless as if they had been painted on the walls of the house. At the extreme end of the theatre one might have heard a pin drop. Suddenly as Hamlet goes rather far up the stage somewhat to the left, with his back to the audience, Horatio starts. “Look, my lord, it comes,” says he, pointing to the right where the Ghost is standing immovable, ere one is even aware of it. At these words Garrick turns suddenly round, and at the same moment staggers back two or three paces with trembling knees, his hat falls to the ground, both arms—especially the left—are nearly extended to the full, the hand as high as the head, the right arm more bent and the hand lower, the fingers spread out and the mouth open. There he remains standing, with legs far apart, but still in a graceful attitude, as if electrified, supported by his friends. His features express such horror that I felt a repeated shudder pass over me before he began to speak. The almost appalling silence of the assembly, which preceded this scene and made one feel scarcely safe in one’s seat, probably contributed not a little to the effect. At last he speaks, not with the beginning but with the end of a breath, and says in a trembling voice “Angels and ministers of grace defend us,” words which complete whatever may yet be wanting in this scene to make it one of the sublimest and most terrifying of which, perhaps the stage is capable. The Ghost beckons him; then you should see him, with his eyes still fixed upon the Ghost, while yet speaking to his friends, break loose from them, although they warn him not to follow, and hold him fast. But at last, his patience exhausted, he faces them, and with great violence tears himself away, and, with a swiftness which makes one shudder draws his sword on them, saying, “By heavens, I’ll make a ghost of him that lets me.” Then, turning to the Ghost,’ he holds his sword out: “Go on; I’ll follow thee;” and the Ghost moves off. Hamlet remains standing still, his sword extended before him, to gain more distance; and when the audience have lost sight of the Ghost, he begins to follow him slowly, at times stopping, and then going on again, but always with his sword extended, his eyes fixed on the Ghost, with dishevelled hair and breathless, until he, too, is lost behind the scenes. You may easily imagine what loud applause accompanies this exit. It begins as soon as the Ghost moves off, and lasts until Hamlet likewise disappears. 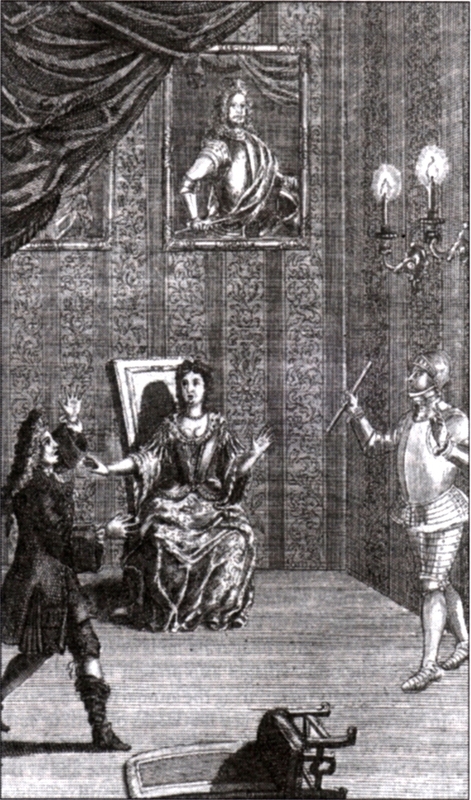 … In the fine soliloquy, “O that this too too solid flesh would melt,” &c, Garrick is completely overpowered by the tears of just grief for a virtuous father, for whom a frivolous mother no longer wears mourning, nor even feels grief, at a time when every parasite of the court should still be wearing black—the most unrestrained of all tears, perhaps because they are the only alleviation which in such a struggle between one duty and another duty an honest heart can procure. Of the words, “so excellent a king,” the last word is quite inaudible; you only perceive it by the motion of the mouth, which closes immediately afterwards firmly, and trembling with agitation, as if to repress with his lips the only too clear indication of the grief which might unman him. This way of shedding tears, which shows the whole burden of inward grief, as well as the manly soul suffering under it, carries one irresistibly away. At the end of the soliloquy he mixes just anger with his grief; and once, when he strikes out violently with his arm to give emphasis to a word in his indignation, the word (to the surprise of the audience) remains unuttered, choked by emotion, and only follows after a few seconds, when tears begin to flow. My neighbour and I, who had not yet exchanged a word, looked at each other and spoke. It was irresistible. 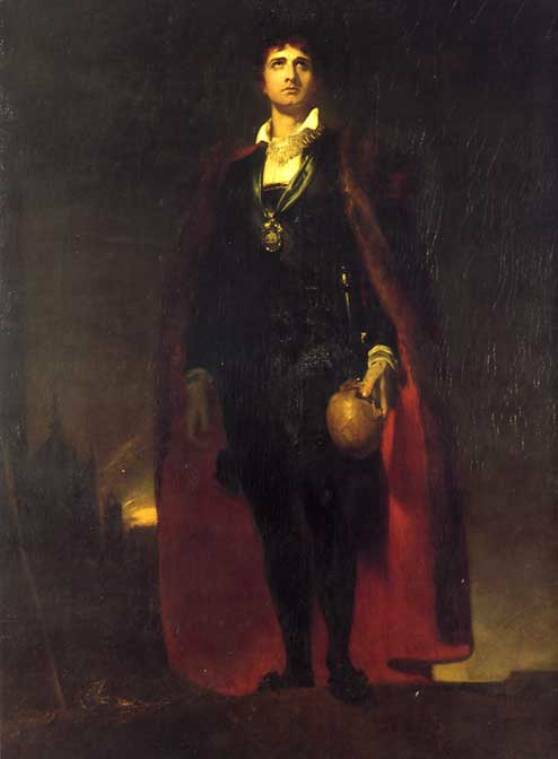 … Hamlet, who, as I have already reminded you, is in mourning, appears here with thick, loosened hair, some of it hanging over one shoulder, he having already begun to play the madman; one of his black stockings is half-way down his leg, showing the white understocking, and a noose of red garter hangs down the middle of the calf. Thus attired, he steps slowly forward in deep thought, supporting his chin with his right hand, and the elbow of the right with the left, looking on one side on the ground in a dignified manner. Here, taking his right hand away from his chin, but, if I mistake not, still holding it supported by the left, he utters the words “To be or not to be” softly; but they are everywhere audible, on account of the great stillness, and not through the peculiar gift of the man, as some of the papers state. The graveyard scene is suppressed at Drury Lane. At Covent Garden it is still kept. This suppression Garrick should not have introduced. Such a splendid old piece, with all its fine characteristic raw strength, would still in these mealy-mouthed times, when even the language of nature begins to give way to conventional babble, have broken the fall of it even if it had not been able to uphold it. I must pass over some of the most beautiful scenes, among others that in which he instructs the actors, as well as that in which he thunders into his mother’s heart the comparison between his uncle and his father when the Ghost appears; one blow upon another before one has yet recovered. Comments: Georg Christoph Lichtenberg (1742-1799) was a German physicist and philosopher. A keen Anglophile, he visited England in 1770 and over 1774-1775. His celebrated account of David Garrick‘s performance in Hamlet (original diary entries reveal that he saw the production on 2 and 12 December 1774) was written in two letters to his friend Heinrich Christian Boie in 1775 and originally published in Boie’s literary periodical Deutsches Museum in November 1776. Text: Sept. 27th. While riding in Hyde Park my groom fell from his horse and hurt his foot badly. I dined at the Piazza Coffee House and later went to Lady Floyd who had offered me a place at her box at Covent Garden. They performed Hamlet. Charles Kemble filled the title-rôle, and did it very well. He has a noble presence, but puts too much pathos into the part for which, too, he is not young enough. Miss Mathews as Ophelia so overdid the character, one of the most interesting in English tragedy, that she almost made a caricature of it. It is a pity that a play containing so many beauties should be spoilt, as most of Shakespeare’s are, by certain blemishes of taste. In spite of excisions, much had been left in which may suit the spirit of the people but to which others object. The management has to consider the former rather than the latter. Comments: Baron Philipp von Neumann (1781-1851) was an Austrian diplomat, posted at the Austrian embassy in London during the 1810s and 1820s. 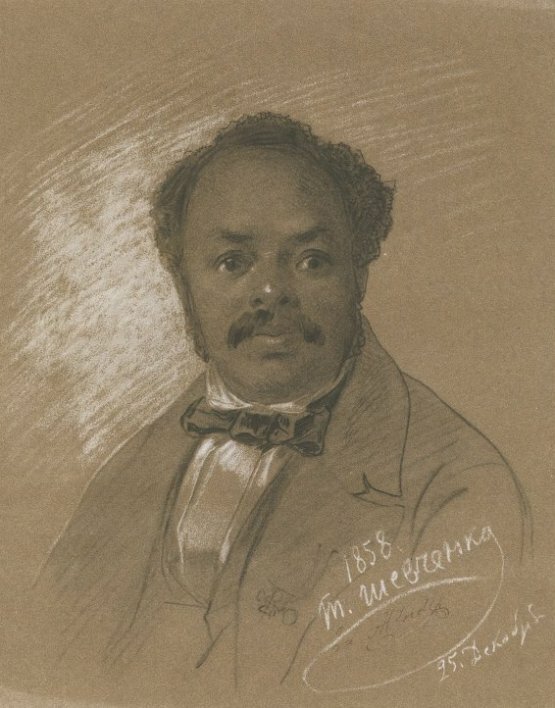 His diaries provide a detailed account of the political and high society life of the time, and document his many visits to the theatre and opera. Charles Kemble, at the time of this production, was forty-four years old. Miss Mathews (presumably related to theatre manager Charles Mathews) had stood in at short notice for Ann Maria Tree, who was unwell. At 9 o’clock tonight to the Grand Theatre to see Miss Clare Howard in Hamlet. The company appearing there this week is Mr George Daventry’s and with the exception of this one performance they are playing melodrama – The Indian Mutiny and Lost in Paris. In both these plays, I think – certainly in The Indian Mutiny Miss Howard takes a female character which she plays with much vigour to the great delight of ‘Grand’ audiences. Hamlet seems to have been added to her repertoire some time ago, to judge from the photographs I have seen about, but I had never heard of her until she appeared here. The scenery and the dresses look as though they were the company’s own, so they must be playing the tragedy elsewhere. Miss Howard, who according to the Express, is Mr Daventry’s wife, is tall and has clear cut features with a well shaped nose. In Hamlet she wore a rather tight fitting gown, somewhat resembling a cassock, through which very occasionally we caught a glimpse of a black stockinged leg. Above this gown was a loose robe of the shape of an M.A.’s, and towards the end of the play she wrapped round her a dark heliotrope coloured cloak. At her waist was a dagger. The hair was worn loose over the shoulders. Miss Howard has not very emotional features, and the only passion she can indicate is anger. She has a loud voice, obviously that of a queen of melodrama, but as it is by no means a feminine one, it is not unsuited to the role. Tis now the [very] Witching time of night. and the black velvet curtains at the back parted to reveal the motionless figure of the Ghost. The Ghost at the Grand differed a little from the one at the Royal. Its garments were shaped more like ordinary mortals’ and they hone with the brilliancy of many silver spangles. The scene with the mother was hardly taken in a right filial spirit – if Hamlet was chiefly mad ‘bending his eye on vacancy.’ Miss Nellie King, a rather stout lady, who was the Queen could not add any dignity to this scene. Unfortunately she would keep reminding me of the Lady queens in the ‘portables’ of my youth. In Act 4 Scene 2 Miss Howard made plain a point which Mr Benson it seems to me missed. I mean the little passage where Hamlet calls the King his mother. King Thy loving father, Hamlet. Hamlet My mother: father and mother is man and wife; man and wife is one flesh; and so my mother. The concluding words – ‘For England’ – were very vigorously delivered by our female Hamlet, and brought down the house. The preceding passage, ‘if your messenger find him not there, seek him i’ the other place yourself’ had also been delivered with much unction and was [in a] new light to me. At the end of Act 4 Scene 3 Miss Howard introduced a new reading. The King sat down and wrote a letter for Rosencrantz and Guildenstern to carry asking for Hamlet to be assassinated. Hamlet overhears this read, comes in and writes another letter, on similar parchment, asking for the messengers who carry it to be slain. Then Rosencrantz and Guildenstern appear, Hamlet asks to look at the parchment they carry, and before handing it back substitutes his own for it. For this scene the Express says Miss Howard has found her authority in an old folio. I should like, however, to make some examination of the old texts before passing any judgement on it. At the end of Act 4 the body of Ophelia was brought in on a bier, and after Laertes’ speech the curtain came down on his standing weeping over it. The applause was so great that it had to go up again, and then we saw the bier moving off with the grief stricken brother helped along after it – a very effective ending. The churchyard scene was taken in on true low comedy vein by the two clowns. The only thing I did not like about the 1st grave digger was his slapping of the skulls with his hands which made the audience laugh immoderately. For the rest, he was rather good, and though his work was of a more common order than Mr Weir’s, yet in a theatre like this it was more effective, and I am half of an opinion that it was also more humorous. The interment of Ophelia was not so well managed as at the Benson’s performance, for the body was lifted into the grave in our sight. The consequence was that the work not being done neatly, a number of the ‘gods’ took it into their heads to laugh, and the laughter was repeated when Laertes jumped into the grave a few minutes later and half lifted the body up again in wishing Ophelia farewell. The message of Osric was delivered by the very nicely spoken girl I have mentioned as appearing as the Player Girl. Here, she looked very nice in her boy’s suit, besides acting the part charmingly. On the program I see the name of the Player Queen was given as Miss Marie Ellerton, Osric being down to somebody else entirely, but really, I believe, she was Miss Daventry, Miss Howard’s daughter. I was much pleased with her. The stage had been darkened for this moment and a strong white light was thrown on her face to set off its agony. This was undoubtedly a capital piece of work. At the Benson rendering of the play there was so much confusion on the stage at the finish, that I have no idea how Hamlet died. It seems a point in Miss Howard’s favour that her death scene should have made so strong an impression on, a least, one spectator. Undoubtedly this Hamlet of Miss Howard’s was a very interesting performance. As I have pointed out it had some strong points, and every now and then there was an introduction of impressive business, as for instance where the actress silently crossed herself at the words, ‘To what base uses we may return, Horatio’ (Act 5 Scene 1). Miss Howard showed herself to be possessed of a surprisingly powerful voice and she carried the whole play through with great vigour. The chief fault in the performance was that Hamlet was never made to appear mad or, perhaps as he really was, to be shamming a madness. On the contrary, he was a remarkably sane person, and one not very polite to his betters, to boot. 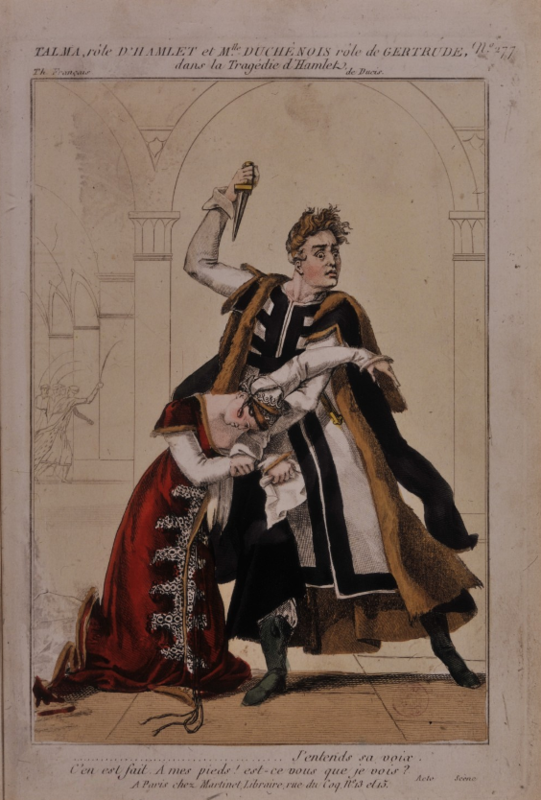 If Miss Howard could rid herself of all traces of melodrama for this one play, and make Hamlet more of the moody scholar, she would give a capital representation of the character. Polonius and the 1st gravedigger were taken, I think, by the same actor – Mr John Hignett, who makes a very useful player. Polonius both in looks and manner very much resembled the same individual in the Benson performance. The King (Mr Magill Martyn), like the Queen, was too much extracted from melodrama to be satisfactory. Laertes (Mr George Daventry) was also of the common order, but acted very vigorously and much to the satisfaction of the ‘house.’ Mr Daventry wears a moustache and speaks with his mouth awry. Miss Ethel King, the Ophelia, rather pleased me. She is young and the part was evidently a heavy task for her, but she managed it very nicely. The rest of the actors were a more or less feeble lot. For the first time in my experience of the stage I saw an actor (Guildenstern) who did not know What to do with his hands. Possibly, however, he was little more than a super. There was a very good house in the popular parts to see the performance and the boxes and dress circle all had their occupants. It was quite apparent that the audience was much interested in the play, but it had not the same critical judgement as the house at the Benson performance. Here at the ‘Grand’ the ‘gods’ could not help laughing at the word ‘bloody’, and the noise had nearly grown into a roar before it was hushed down. At our other theatre a disturbance of this kind was not tolerated at its inception. Comments: Sydney Race (1875-1960) was the working-class son of a Nottingham cotton mill engineer. He worked as an insurance clerk, later in the Nottinghamshire Education Department. He was an keen contributor to Nottinghamshire newspapers and historical journals, and kept a journal in which records the many kinds of entertainment that he saw in Nottingham. He saw Hamlet at the Grand Theatre, Nottingham, on 26 October 1899. Clare Howard was a leading lady at the Pavilion Theatre, Whitechapel, specialising in melodramas with her husband George Daventry. My thanks to Ann Featherstone, editor of Race’s journals, for permission to reproduce this text. Text: Betterton was an Actor, as Shakespear was an Author, both without Competitors! form’d for the mutual Assistance and Illustration of each others Genius! How Shakespear wrote, all Men who have a Taste for Nature may read and know — but with what higher Rapture would he still be read could they conceive how Betterton playd him! Then might they know the one was born alone to speak what the other only knew to write! Pity it is that the momentary Beauties flowing from an harmonious Elocution cannot, like those of Poetry, be their own Record! That the animated Graces of the Player can live no longer than the instant Breath and Motion that presents them, or at best can but faintly glimmer through the Memory or imperfect Attestation of a few surviving Spectators. Could how Betterton spoke be as easily known as what he spoke, then might you see the Muse of Shakespear in her Triumph, with all her Beauties in their best Array rising into real Life and charming her Beholders. But alas! since all this is so far out of the reach of Description, how shall I shew you Betterton? Should I therefore tell you that all the Othellos, Hamlets, Hotspurs, Mackbeths, and Brutus‘s whom you may have seen since his Time, have fallen far short of him; this still would give you no Idea of his particular Excellence. Let us see then what a particular Comparison may do! whether that may yet draw him nearer to you? You have seen a Hamlet perhaps, who, on the first Appearance of his Father’s Spirit, has thrown himself into all the straining Vociferation requisite to express Rage and Fury, and the House has thunder’d with Applause; tho’ the mis-guided Actor was all the while (as Shakespear terms it) tearing a Passion into Rags – I am the more bold to offer you this particular Instance, because the late Mr. Addison, while I sate by him to see this Scene acted, made the same Observation, asking me, with some Surprize, if I thought Hamlet should be in so violent a Passion with the Ghost, which, tho’ it might have astonish’d, it had not provok’d him? for you may observe that in this beautiful Speech the Passion never rises beyond an almost breathless Astonishment, or an Impatience, limited by filial Reverence, to enquire into the suspected Wrongs that may have rais’d him from his peaceful Tomb! and a Desire to know what a Spirit so seemingly distrest might wish or enjoin a sorrowful Son to execute towards his future Quiet in the Grave? This was the Light into which Betterton threw this Scene; which he open’d with a Pause of mute Amazement! then rising slowly to a solemn, trembling Voice, he made the Ghost equally terrible to the Spectator as to himself! and in the descriptive Part of the natural Emotions which the ghastly Vision gave him, the boldness of his Expostulation was still govern’d by Decency, manly, but not braving; his Voice never rising into that seeming Outrage or wild Defiance of what he naturally rever’d. But alas! to preserve this medium, between mouthing and meaning too little, to keep the Attention more pleasingly awake by a temper’d Spirit than by meer Vehemence of Voice, is of all the Master-strokes of an Actor the most difficult to reach. In this none yet have equall’d Betterton. But I am unwilling to shew his Superiority only by recounting the Errors of those who now cannot answer to them, let their farther Failings therefore be forgotten! or rather, shall I in some measure excuse them? For I am not yet sure that they might not be as much owing to the false Judgment of the Spectator as the Actor. While the Million are so apt to be transported when the Drum of their Ear is so roundly rattled; while they take the Life of Elocution to lie in the Strength of the Lungs, it is no wonder the Actor, whose end is Applause, should be also tempted at this easy rate to excite it. Shall I go a little farther? and allow that this Extreme is more pardonable than its opposite Error? I mean that dangerous Affectation of the Monotone, or solemn Sameness of Pronounciation, which, to my Ear, is insupportable; for of all Faults that so frequently pass upon the Vulgar, that of Flatness will have the fewest Admirers. That this is an Error of ancient standing seems evident by what Hamlet says, in his Instructions to the Players, viz. Be not too tame, neither, &c.
The Actor, doubtless, is as strongly ty’d down to the Rules of Horace as the Writer. He that feels not himself the Passion he would raise, will talk to a sleeping Audience: But this never was the Fault of Betterton; and it has often amaz’d me to see those who soon came after him throw out, in some Parts of a Character, a just and graceful Spirit which Betterton himself could not but have applauded. And yet in the equally shining Passages of the same Character have heavily dragg’d the Sentiment along like a dead Weight, with a long-ton’d Voice and absent Eye, as if they had fairly forgot what they were about: If you have never made this Observation, I am contented you should not know where to apply it. There is no Terror, Cassius, in your Looks! &c.
Not but in some part of this Scene, where he reproaches Cassius, his Temper is not under this Suppression, but opens into that Warmth which becomes a Man of Virtue; yet this is that Hasty Spark of Anger which Brutus himself endeavours to excuse. But with whatever strength of Nature we see the Poet shew at once the Philosopher and the Heroe, yet the Image of the Actor’s Excellence will be still imperfect to you unless Language could put Colours in our Words to paint the Voice with. Et, si vis similem pijigere, pinge sonum, is enjoyning an impossibility. The most that a Vandyke can arrive at, is to make his Portraits of great Persons seem to think; a Shakespear goes farther yet, and tells you what his Pictures thought; a Betterton steps beyond ’em both, and calls them from the Grave to breathe and be themselves again in Feature, Speech, and Motion. When the skilful Actor shews you all these Powers at once united, and gratifies at once your Eye, your Ear, your Understanding: To conceive the Pleasure rising from such Harmony, you must have been present at it! ’tis not to be told you! Comments: Colley Cibber (1671-1757) was an English actor-manager, playwright and poet laureate, whose engaging memoir Apology for the Life of Colley Cibber is one of the best accounts we have of the theatre of his times. He began his acting career in Thomas Betterton‘s company in 1690, and rose in the profession to become manager of Drury Lane Theatre in 1710. Thomas Betterton (c.1635-1710) was the leading English male actor of his time, who frequently played Shakespearean roles (generally in adaptations by writers of the period, including Betterton himself). Going by the rough chronology of Cibber’s memoir, he is referring to performances of Betterton in Hamlet in the 1690s. Shakspeare is ‘the great humanist,’ in sympathy with the clear unwarped reason of ‘a living Horace or Horatio,’ an Horatio intrepid as the author of ‘non vultus instantis tyranni.’ This is fantastic. Far from abhorring Hamlet, Shakspeare was probably in considerable sympathy with him: nor is he likely to have thought either that salvation for mankind was to be had from the Odes of Horace. Mr. Feis is too entire, too absolute. Nevertheless his book is of real interest and value. He has proved the preoccupation of Shakspeare’s mind when he made Hamlet with Montaigne’s Essays. John Sterling had inferred it, but Mr. Feis has established it. He shows how passage after passage in the second quarto of Hamlet, published in 1604, has been altered and expanded in correspondence with things in the first English translation of Montaigne’s Essays, Florio’s, published in 1603. The Essays had already passed through many editions in French, and were known to Shakspeare in that language. Their publication in English was an event in the brilliant and intellectual London world, then keenly interested in the playhouses; and Shakspeare, in revising his Hamlet in 1604, gives proof of the actual occupation of his patrons with the Englished Montaigne, and confirms, too, the fact of his own occupation with the Essays previously. For me the interest of this discovery does not lie in its showing that Shakspeare thought Montaigne a dangerous author, and meant to give in Hamlet a shocking example of what Montaigne’s teaching led to. It lies in its explaining how it comes about that Hamlet, in spite of the prodigious mental and poetic power shown in it, is really so tantalising and ineffective a play. To the common public Hamlet is a famous piece by a famous poet, with crime, a ghost, battle, and carnage; and that is sufficient. To the youthful enthusiast Hamlet is a piece handling the mystery of the universe, and having throughout cadences, phrases, and words full of divinest Shakspearian magic; and that, too, is sufficient. To the pedant, finally, Hamlet is an occasion for airing his psychology; and what does pedant require more? But to the spectator who loves true and powerful drama, and can judge whether he gets it or not, Hamlet is a piece which opens, indeed, simply and admirably, and then: ‘The rest is puzzle’! The reason is, apparently, that Shakspeare conceived this play with his mind running on Montaigne, and placed its action and its hero in Montaigne’s atmosphere and world. What is that world? It is the world of man viewed as a being ondoyant et divers, balancing and indeterminate, the plaything of cross motives and shifting impulses, swayed by a thousand subtle influences, physiological and pathological. Certainly the action and hero of the original Hamlet story are not such as to compel the poet to place them in this world and no other, but they admit of being placed there, Shakspeare resolved to place them there, and they lent themselves to his resolve. The resolve once taken to place the action in this world of problem, the problem became brightened by all the force of Shakspeare’s faculties, of Shakspeare’s subtlety. Hamlet thus comes at last to be not a drama followed with perfect comprehension and profoundest emotion, which is the ideal for tragedy, but a problem soliciting interpretation and solution. It will never, therefore, be a piece to be seen with pure satisfaction by those who will not deceive themselves. But such is its power and such is its fame that it will always continue to be acted, and we shall all of us continue to go and see it. Mr. Wilson Barrett has put it effectively and finely on the stage. In general the critics have marked his merits with perfect justice. He is successful with his King and Queen. The King in Hamlet is too often a blatant horror, and his Queen is to match. Mr. Willard and Miss Leighton are a King and Queen whom one sees and hears with pleasure. Ophelia, too what suffering have Ophelias caused us! And nothing can make this part advantageous to an actress or enjoyable for the spectator. I confess, therefore, that I trembled at each of Miss Eastlake’s entrances; but the impression finally left, by the madness scene more especially, was one of approval and respect. Mr. Wilson Barrett himself, as Hamlet, is fresh, natural, young, prepossessing, animated, coherent; the piece moves. All Hamlets whom I have seen dissatisfy us in something. Macready wanted person, Charles Kean mind, Fechter English; Mr. Wilson Barrett wants elocution. No ingenuity will ever enable us to follow the drama of Hamlet as we follow the first part of Faust, but we may be made to feel the noble poetry. Comments: Matthew Arnold (1822-1888) was an English poet, critic and essayist. His ‘Letters of an Old Playgoer’, five short essay-reviews written 1882-1884 for The Pall Mall Gazette. The Princess’s Theatre production of Hamlet featured Wilson Barrett as Hamlet, Edward Willard (Claudius), Margaret Leighton (Gertrude) and Mary Eastlake (Ophelia).